“… over the moor towards Hexworthy to find Horn’s Cross, which however, I did not succeed in doing, although I searched diligently around the tumulus near which it should be. The only parts remaining, I understand, are the socket stone and a portion of the shaft lying prostrate, which must have been effectually hidden in the luxuriant heather”. It is amazing how quickly the landscape can change, in 1892 Chudleigh describes, “luxuriant heather”, and 115 years later there is hardly any sign of a heather around the cross as can be seen from the photo below. The cross was restored sometime prior to 1928 by means of a metal tie or clamp which attached the small head to the shaft. It is a safe bet to suggest that the shaft was not the original one and was fashioned at the time of the restoration. Today, Horn’s Cross stands at a statuesque 1.95m and has a half-span of 57cm aligned in a NE – SW direction, Sandles, p. 48. The actual spot where the cross stands marks the intersection of two trans-moor tracks, one being the Cumston to Dockwell track and the other being, as mentioned above, the Maltern Way. Is it a coincidence that where these tracks intersect is also the location for a Bronze Age burial cairn and the nearby remains of a stone row? It could be that someone found the need to sanctify the passage of what was an ancient monastic track as it wound its way through the pagan ritual site. Many of these early moorland tracks could have quite easily have followed the course of much earlier prehistoric pathways which were also marked with standing stones or menhirs. Could one of these originally have stood in this Bronze Age ritual landscape and was later replaced by a ‘cleansing’ Christian Cross? From Horn’s Cross it is on a clear day possible to see the next cross which marks the Maltern Way in the form of Horse Ford Cross. As always such a prominent landmark has been used extensively as a subject for letterbox stamps over the years, below is but one example. The actual place where the cross stands is known locally as the Stacombe Telling Place. This place-name arose from the fact that a moorman who was in charge of a flock of sheep from nearby Staddicombe would gather his sheep here for ‘telling’ or counting. There are several places on the moor where this occurred, another being the Sheep Measure on nearby Laughter Tor. 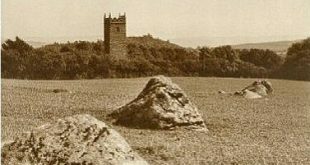 Crossing, W. 1987 The Ancient Stone Crosses of Dartmoor, Devon Books, Exeter. Sandles, T. 1997 A Pilgrimage to Dartmoor’s Crosses, Forest Publishing, Liverton.